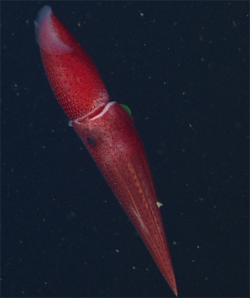 New research findings highlight a unique visual adaptation in a deep-sea squid. 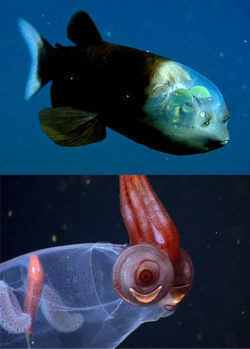 The cockeyed squid, Histioteuthis heteropsis, has eyes that are grossly different in size and structure. Animals use vision for three primary reasons—to find food, to avoid being eaten, and to find a mate. 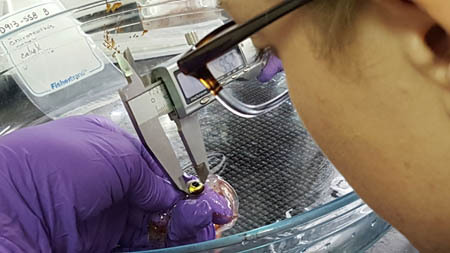 Eyeballs of squids in the family Histioteuthidae are highly modified to tackle these tasks with maximum efficiency in a light-limited environment. Cockeyed squid are born with two identical eyes, just like any other squid hatchling, but as they develop into juveniles the left eye begins to surge ahead in size. By the time they reach adulthood, the left eye can be more than twice as big as the right one! It also develops a semi-tubular structure and often has a striking yellow lens. Originally described in the late 1800s, marine biologists have definitely been scratching their heads for the past 150 years over the unusual eye discrepancy observed in the cockeyed squid. “You can’t look at one and not wonder what’s going on with them,” said Duke graduate student and lead author of the study, Kate Thomas. No other mollusc is so mismatched. In fact, according to Thomas, no other bilaterally symmetrical animals are known to exhibit two distinct, or dimorphic, eyeballs. Specializations in eye structure, number, or size are always seen in pairs. “This family of squids live in the twilight zone—where sunlight is really, really dim—and (using MBARI’s ROVs) we observed these squid in their natural habitat to see what they were doing with these eyes,” Thomas said. The twilight, or mesopelagic, zone of the ocean lies 200 to 1,000 meters (600 to 3000 feet) deep, making it technically challenging and expensive to study these animals. Thomas began looking closely at these animals while she was a summer intern at the Monterey Bay Aquarium Research Institute (MBARI). She combed through 25 years of archival deep-sea video from MBARI’s ROVs. The video was annotated using MBARI’s Video Annotation and Reference System (VARS), which allowed Thomas to easily go back and review 161 Histioteuthis heteropsis observations recorded in the database. 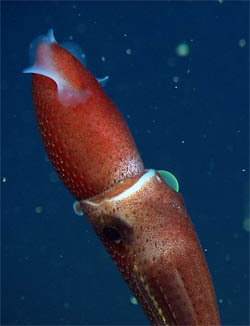 In its natural habitat, the cockeyed squid was consistently observed in an oblique position with the larger left eye facing slightly upward and the smaller right eye facing slightly downward. Lab studies using visual simulations indicated that the enlarged, semi-tubular form of the left eye increases sensitivity to pick up very dim downwelling surface light. The yellow lens is specialized for breaking counter-illumination (a camouflaging technique in which prey items use bioluminescence to eliminate their shadows), “like putting on a pair of glasses that filter out background light and make your camouflaged target stand out more,” Thomas said. The role of the downward-facing right eye is to pick up bright bioluminescent flashes against the dark waters below, and therefore it does not need the increased size or semi-tubular sensitivity boost. The more typical shape of this eye allows for a wider field of view while scanning for predators lurking below. In situ, Histioteuthis orients in an oblique position with the small eye facing down and the large eye with its yellow lens facing upwards. Eyes are physiologically expensive to make and maintain, Thomas explained. “You want eyes just big enough to do what you need to do, but you don’t want to have any bigger eyes because then you are just wasting resources,” she said. For Thomas and her coauthors, the deep sea is a particularly fascinating place to study eye adaptations because of the unique light conditions: the light field is highly directional, with sunlight only coming from directly above, and bioluminescence the only light source below. Studying how animals visually adapt to the challenges of limited light in the largest habitat on Earth helps us to better understand eye function and evolution. This research was supported by MBARI, the National Science Foundation, and Duke University. The results are published in a special issue of the journal Philosophical Transactions B. focusing on visual adaptations to dim light. Thomas, K.N., B.H. Robison, and S. Johnsen (2017). Two eyes for two purposes: In situ evidence for asymmetric vision in the cockeyed squids Histioteuthis heteropsis and Stigmatoteuthis dofleini. Philosophical Transactions of the Royal Society B, doi: 10.1098/rstb.2016.0069. Apr 2, 2018 – MBARI researcher Steve Litvin is investigating the feeding habits of juvenile market squid in changing ocean conditions. It's a tale of two krill. Jan 31, 2018 – A recent paper describes an unusual discovery: dead squid littered across the deep sea bottom. Aug 31, 2016 - Cannibalism is not so unusual in the deep sea, especially for squid, but until recently the diet of Gonatus squid was largely unknown. Remotely operated vehicle observations of these squid in their natural habitat have enabled scientists to learn a great deal more about their feeding behavior.